On this page you will learn how DNA is merely an instruction of how to make a protein. RNA stands for ribonucleic acid there are several different types, and are distinguished by a small letter in front of the RNA. It is similar to DNA, and is made up of nucleotides, but with a few important differences. It is only a single strand of nucleotides, rather than a double like DNA. The sugar is ribose instead of deoxyribose. Where DNA has the base Thymine, RNA has Uracil (U). 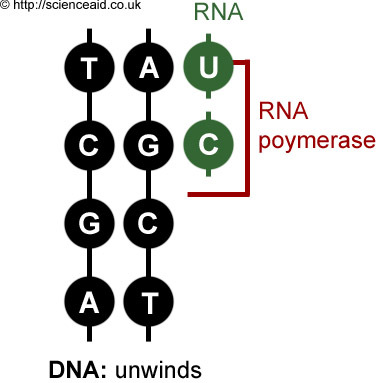 The first step is for the DNA to unwind, now RNA polymerase goes along the strand with the genetic code and catalyses the mRNA nucleotides together making a copy of the genetic sequence (like a negative in photography). The mRNA molecules peel away from the DNA and leave the nucleus and into the cytoplasm. The purpose of transcription was to make a copy of the code since the DNA is the master copy and too previous to leave the nucleus. At this stage the genetic code in the mRNA molecule is used to build a polypeptide, which can then be used for a protein or enzyme. It could even become one of the enzymes which helps in protein synthesis. Floating around in the cytoplasm are ribosomes and tRNA molecules. This tRNA is attached to a specific amino acid at the top, and at the bottom is has an anti codon. The anti-codon is complimentary to the codon on the mRNA, for example, the first codon on the mRNA is AUG, the anti-codon on the tRNA would be UAC, which corresponds to Methionine. 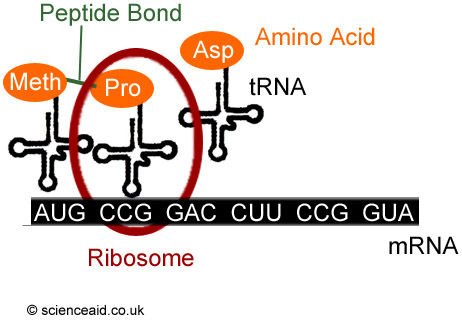 The ribosome moves along the mRNA systematically fusing together the amino acids it goes along. Eventually it gets to a stop codon, so the chain is complete, creating a polypeptide these can interact in diferent ways to create a protein or enzyme. A gene mutation occurs when there is a change in the sequence of bases, such as when a gene is copied incorrectly. This can result in one or more different amino acids being incorporated into the protein. To simplify this, if the codon is supposed to be AUG which codes for Methionine but a mutation occurs so that it reads AUC it would be isoleucine. Which changes the polypeptide and then the protein or enzyme slightly. However, it doesn't always result in a change because there are several codes for each amino acid. There are three main types of mutation that could occur; examples of these are in the table below.